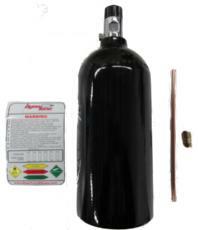 2.5LB Nitrous Oxide Bottle with high flow valve. Holds 2.5LB's of nitrous and comes with a siphon tube(not installed)Does not come with blue fitting shown! aluminum tank, great size for small kits and bikes. Bottle sticker not installed on bottle but included! Comes in Black, Brushed Silver or Show Polished Chrome!